Arsenal finished their Premier League campaign with a 2-0 win away to Norwich. The gunners named a changed side with Fabianski featuring for the first time this season in the League. I had expected Szczesny to be in goal in other to get his Golden gloves but Wenger thought otherwise. Other changes included the omission of Per Metersacker and Captain Vermaelen. Fabianski the Cup-goalie was on hand to keep the canaries from scoring. The 1st half ended goalles with Ruddy preventing Podolski and Giroud from scoring. In the second half Ramsey scored a beauty of a goal to break the deadlock. Giroud’s cross was volleyed past Ruddy to the delight of the Welshman. Jenkinson would finally break his Arsenal duck scoring from close range. Wilshere returned but the return of Abou Diaby was a delight. The France international, wearing his number 24 jersey for the first time did some tricks as usual to the applause of the fans. Yaya Sanogo also tried to break his duck but he would need to wait till the FA Cup final or even next year. On a poll posted here, just over 42% expected Diaby to return with 19% awaiting Sanogo’s 1st goal for Arsenal this season. So, the gunners ended their campaign with 79 points from 38 games, finishing 4th. The gunners were the 4th best strike force with 68 goals and 4th best defence with 41 goals conceded thus finishing 4th best Goal Difference. With 17 clean sheets, only bettered than Chelsea, the gunners failed to score in 6 games. The 2013/14 English Premier League finally came to an end on Sunday with Manchester City beating Westham to lift the trophy. Goals from Samir Nasri and Vincent Kompany were enough for the blue half of Manchester to celebrate with their new manager Manuel Pellegrini. 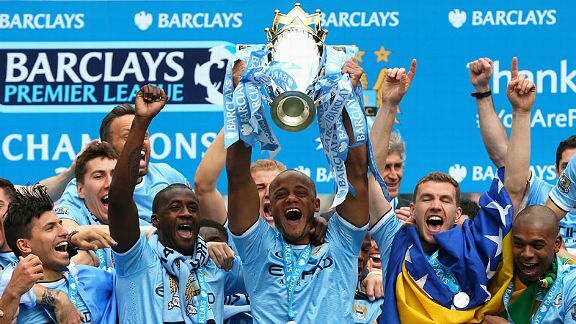 Pellegrini becomes the first non-european to lift the Premier League. While they hoped for a Carroll miracle at the Etihad, Liverpool started on a bad foot with an own goal from Martin Skrtel in the first half. The reds would respond in the 2nd half with goals from Agger and Sturridge. Both Daniel goals were from Steven Gerrard’s freekicks. The reds will surely be disappointed. Next season will involve champions league football and would be more demanding. This may have been their best chance. As for the Blues, they were stung by relegated Cardiff City thansks to a defelected shot from Craig Bellamy. But goals from Schurle and Torres were enough to spare Mourinho’s blushes. The Blues will finish trophyless with Mourinho’s 2nd consecutive trophylessness. Jose controversies continued with his discredit of Luiz Suarez’s award as player of the year. He prefers Dzeko of City. So the 2013/14 has ended. FA Cup final is next.